With the advancement of technology, silica has been now used for many typical applications such as aerospace, military and precision automotive parts and in China which is one of the fastest growing economies the silica demand becomes more vital. Demand for silica is increasing in China with supply becoming more constrained. As a result, China has acknowledged silica sand as a strategic mineral; constrained exports and have become a net importer. China produces about 80,000 metric tons of Industrial Sand And Gravel (Silica) annually. The China foundry industries average consumption for 2016 was 14,400 tons which represent 18% of China’s silica production and imports. Further uses of silica sand in China comprise whole grain silica for building products, glasses, ceramic, bricks, tile, etc. which accounts for 31.4% of the total silica production in China. Goldstein Research analyst forecast China Silica Industry is anticipated to garner USD 6.4 billion by 2025. Further, the China silica industry is expected to expand at a CAGR of 9.1% during the forecast period i.e. 2017-2025. With the explosion in industrial, construction and automotive sectors the China silica market is likely to boom over the forecast period. Based on the applications, glass manufacturer and oil industries are the dominating silica applications. Together, they consumed about 52% of the total silica production. With approximately 70% of each glass batch being silica sand, float glass and glass container manufacturers are countable for the most use of silica sand. The report covers the present ground scenario and the future growth prospects of the Silica Industry for 2017-2025 along with the market players’ analysis. We calculated the market size and revenue share on the basis of revenue generated from major players in all major regions. China Silica Market Report is forecasted on the basis of revenue analysis, product benchmarking and strategic developments of key market players. China Silica Industry Outlook 2017-2025, has been prepared based on an in-depth market analysis from industry experts. 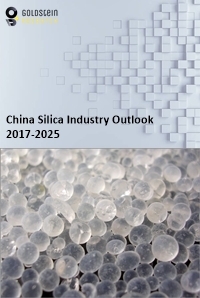 The report covers the competitive landscape and current position of major players in the China Silica Industry space. The report also includes Porter’s five force model, SWOT analysis, company profiling, business strategies of market players and their business models. “China Silica Industry Report” also recognizes value chain analysis to understand the cost differentiation, pricing models to provide a competitive advantage to the existing and new entry players. Our China silica market analysis report comprises of the following companies as the key players: Jiangxi Blackcat Carbon Black Inc. Ltd., Fujian Yuanxiang New Chemicals Co. Ltd, Wuxi Quechen Silicon Chemical Co., Adwan Chemical Industries, Badger Mining, CEMEX SAB, EUROQUARZ GmbH, Fairmount Santrol, Saint-Gobain, Taiwan Glass Industry, Tochu Corporation, Pioneer Natural Resources, Zhuzhou Kibing Group, Evonik Industries AG, PPG Industries Inc., W.R. Grace & Co., Tosoh Silica Corporation, Solvay SA, Huber Engineered Materials and Oriental Silica Corporation. The study was conducted using an objective combination of primary and secondary market information including inputs from key participants in the industry. The report contains a comprehensive market and vendor landscape in addition to a SWOT analysis of the key vendors.